Size Height 280 mm, width 187 mm. Watermark Two watermarks. Unicorn with 4 legs, little circle on top of the forehead. Crown with encircled cross. Drake's identification: Watermark type 13. Drake's description: Rhinoceros 75mm (smaller on letter cited?). Date of earliest letter with this watermark is August 1607. 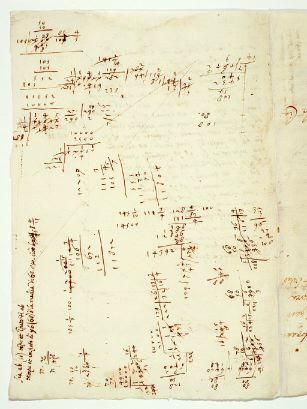 Comments Written by Galileo; contains calculations, short text, drawings. Relation to the Discorsi: work on theorem of equivalence. 1 Sia ab (50) tempo et impeto di ab; tempo et impeto di yb (68) è la media di 68 e 50, cioè 58 4/11.